As everyone in the advertising world gathers in the south of France for the annual Cannes festival, Google and Facebook are top of mind. More specifically, everyone’s talking about how they’re afraid of the two online giants’ advertising market dominance, AOL CEO Tim Armstrong tells The Wall Street Journal’s Jack Marshall. Before going to AOL, Armstrong ran sales at Google for nearly a decade. 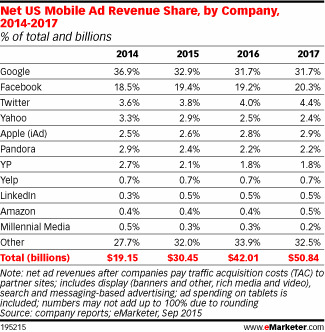 Right now, Google and Facebook control 43% of global ad revenue, according to data from eMarketer (in an eMarketer chart of US ad revenue on the right, AOL is represented by Millennial Media). Both companies are often described as “walled gardens” because they restrict or make it difficult for marketers to use their own data or third-party measurement tools. Armstrong said that Verizon-owned AOL is trying to take the opposite approach.